Gordon Banks, who has died at the age of 81, was not just one of the few Englishmen to have won a World Cup, he was also one of the few to leave Pele dumbfounded. Having won the FIFA Goalkeeper of the Year award for six straight years between 1966 and 1971, Banks was a model of consistency, but he was also a shot-stopper who saved his best for the biggest moments. A League Cup winner with both Leicester City and Stoke City, Banks recorded four clean sheets at the World Cup in 1966 when Alf Ramsey's team won the tournament on home soil, and it was in Mexico four years later when he somehow denied Pele with the 'Save of the Century'. Despite losing sight in his right eye in a car crash in 1972, Banks returned to the sport in 1977 with the Fort Lauderdale Strikers, playing in the North American Soccer League alongside greats such as Pele and George Best. Here we take a look at Banks' career following the news of his passing. A young Banks was left devastated when dropped from his Sheffield schoolboys side as a teenager, and he took up work with a coal merchants and as an apprentice bricklayer in order to earn his keep. It was Chesterfield who gave a 15-year-old Banks his break by offering him youth terms and by 1958 he was making his first-team debut, in a Third Division fixture against Colchester United. Sold to Leicester City the following year, Banks' early Wembley memories were not pleasant - he and the Foxes lost the 1961 and 1963 FA Cup finals to Tottenham and Manchester United. His performances for Leicester did see Banks gain international recognition, however, and he made his England bow in 1963, losing 2-1 to the old enemy Scotland at Wembley. England's 1966 World Cup story might have been very different had manager Alf Ramsey taken a dimmer view of Banks and a number of other senior players, including Bobby Moore and Charlton, breaking a curfew ahead of the tournament. Having escaped serious punishment, the side eased through the group phase, drawing against Uruguay before beating Mexico and France - all without Banks having to pick the ball out of his net. Another clean sheet followed in the quarter-final win over Argentina - an ill-tempered affair which saw Ramsey describe the visitors as "animals" - before a 2-1 semi-final success over Portugal, which saw Banks' goal finally breached by Eusebio's penalty. And so to the final against West Germany, where Wolfgang Weber's late equaliser forced extra-time before Geoff Hurst completed his hat-trick, accompanied by the immortal words of commentator Kenneth Wolstenholme. "As I descended the steps from the royal box, I couldn't believe the journey I had made," Banks said later. "The road from Tinsley Rec to a World Cup final had been long and winding, but the difficulties encountered along the way suddenly evaporated as my whole being was engulfed in euphoria." Amid competition from Peter Shilton, Banks was sold to Stoke in 1967 and five years later lifted his second League Cup, this time in a one-off affair against Chelsea at a Wembley Stadium that was starting to represent the stage for fonder memories. "I'd played in two FA Cup finals with Leicester and two League Cup finals, but this was my greatest and proudest moment in club football," Banks said. "Not only because we won that final, but because Stoke City had been playing football for over 100 years and had never won anything before. "To walk out with the team and listen to the roar of our supporters was great. Then to come back home next day and have 100,000 people welcome us was simply fantastic. I don't think the city had ever had that many people out before. I've always appreciated how the club and the fans appreciated me." England's World Cup defence in 1970 ended at the quarter-final stage as West Germany gained a measure of revenge. Banks missed the game through illness and, watching back at the hotel on a feed delayed by almost an hour, did not believe his team-mates when they returned with the score reading 2-0 only to inform him they had gone on to lose 3-2. A week earlier, Banks had produced the moment that will define his career and perhaps his life. 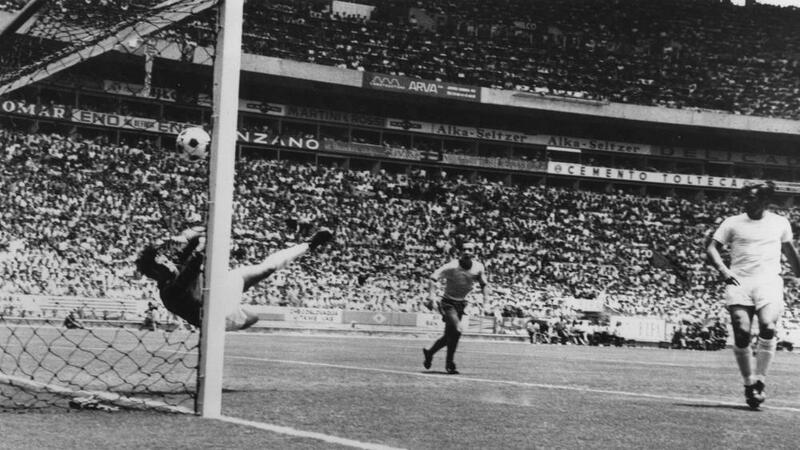 In the 1-0 group-stage defeat to Brazil, Banks pulled off what became known as the "Save of the Century", somehow getting low to his right to tip Pele's powerful downward header up and over the crossbar. "I landed crumpled against the inner side netting of the goal and my first reaction was to look out at Pele. I hadn't a clue where the ball was," Banks said. "He'd grounded to a halt, head clasped between his hands and I knew then all that I needed to know. "As I got to my feet Pele came up to me and patted me on the back. 'I thought that was a goal,' he said. 'You and me both,' I replied."